I'm a news junkie, and for the UK news junkie there's no better channel than Sky News. After the terrorists struck on September 11th, I would come home from work and watch Sky News's coverage for hours on end. When Baghdad fell, Sky News Reporter David Chater was there to talk to the troops as they drove their tanks onto the square in which Saddam Hussein's statue would famously fall. Chater was the only reporter broadcasting live from the square.The pictures were simulcast on news channels worldwide. Sky News launched the world's first interactive TV video news service. It lets viewers choose what they want to watch, from 8 video screens. These can be viewed at up to full-screen size. On election night 2005, Sky News viewers with Sky Digital will have 16 full-size screens from which to choose. 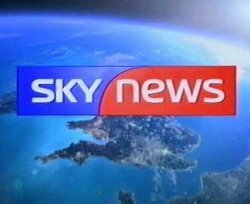 If you want to get a feel for Sky News (but live in the US, or do not have digital TV), check out Johnnie Larkin's authoritative site, SkyNewsCentre. It appears as though I'm not the only fan of Sky News. The SkyNewsCentre discussion forum has 850 registered members. Interactive TV and digital satellite broadcasting offer fantastic possibilities for creating TV that's controlled by the viewer, not by the editor or producer. Why does this matter? Because most people get their news from TV, and as long as that's the case, we're all forced to make do with what the 'average' viewer wants. Our news consists of soundbites from news-makers, not their words in context. Every story that's of interest to you is excluded if it won't interest the average viewer. The time given to stories is cut down to that which the average viewer will accept without switching channels. Interactivity offers depth, breadth, choice, genuine viewer feedback and active participation. Plus the ability to order pizza without leaving the sofa. As all countries move towards digital TV, Sky News is offering a glimpse of how interactive TV will transform your viewing of Television news. For those who don't know, Britain is having a General Election on Thursday 5 May 2005. Find out by visiting http://www.WhoShouldYouVoteFor.com/ . If you really want to know what's going to happen on election night, follow the money. Watch the developments in the political spread-betting market by visiting spread-betting blog Political Betting. To subscribe via Bloglines click here. UPDATE: At the time of writing, it's predicting a Labour party majority of 76. UPDATE 2: The final prediction, on election day itself is a 94 seat Labour majority.